It's officially Fall 2016, and for many Pool owners across the country that means it is time to close down the pool for the season. If this is your first time closing down the pool or would like a refresher, our friends at Swim University have written a great article, How to Close an Above Ground Pool. After prepping the pool water for your pool closing, the last thing you will be doing is covering it up for the winter season. 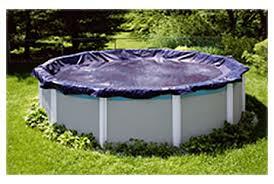 Based upon your individual pool situation and preferences there are specific winter pool covers to meet your needs. Above ground winter pool covers and Inground winter pool covers come in both solid and mesh options as well as vary by thickness and warranty coverage. We also carry the accessories to go with your pool covers, the equalizer pillow in various sizes and water tubes for inground winter pool covers. Our Above Ground Winter Pool Cover offerings include both round and oval shapes, both solid and mesh options, as well as varying warranty options: 8 year limited/1 year full warranty, 10 year limited/1 year full warranty, 15 year limited/3 year full warranty, and our best warranty coverage of a 20 year limited/3 year full warranty. All of our above ground winter pool covers come with a 4 foot overlap and a vinyl coated cable and winch for securing the cover to your pool. For our Inground Winter Pool Cover offerings we include only rectangle shapes, both solid and mesh options, as well as varying warranty options: 8 yr limited/1 yr full, 10 yr limited/1 yr full, 15 yr limited/3 yr full, 20 yr limited/3 yr full, and 25 yr limited/3 yr full. 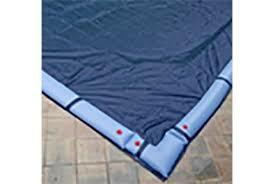 All of our inground winter pool covers come with a 4-5 foot overhang and are made to be held down by water tubes. Water tubes are sold separately. If you are looking for a new winter pool cover and want one of the largest selections and great prices........we've got you covered at All Pool Filters 4 Less.